Remember the glam hard rock band Angel, from the late Seventies. If you're cringing right about now, I completely understand. I had every album (well, there's no accounting for taste), including the hideous live album, Live Without A Net. Strange, or not, how most every guy in the band looked better than 90 percent of the chicks I knew in college at the time. 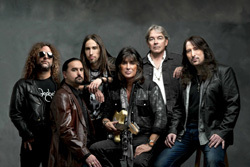 And that includes guitarist Punky Meadows (born Edwin Lionel Meadows). Remember him? He's been out of circulation for some time. After the death of Angel, he went on to several business ventures including running a tanning salon for 13 years. Now, in his mid-sixties, Meadows is nicely tanned, but still rock star skinny and glam band cute. Geez, even his hair is still perfect. He's like the George Hamilton of aging rock stars. The skinny on this album is simple. One, Punky Meadows can still wail on the guitar. His style has always been melodic and smooth, spiced with some metal edge. Mostly, Meadows displays a keen sense of rhythm and groove in every arrangement, assisted by Anniello's own rhythm guitar input. Second, while guitar-forward, the song craftmanship is spot on for classic melodic hard rock. Catchy melodies are tied together with musical hooks and catchy refrains. Additionally, having not looked at the promotional one-sheet while listening, I thought Meadows was also the vocalist. And my first thought was that he sounds really good. But there was something about his tone that reminded me of someone, someone else that I couldn't put my finger on. Well, it's not Meadows at the mic, but rather Chandler Mogel (Outloud, Khaos, et al), one of the best "new" classic rock vocalist around. That's reason enough to give this album your immediate attention. On to a brief song selection. You get something heavier, even edgier, but not without melodic sensibility with Shake Shake, The Price You Pay, and Lost and Lonely. More on the radio-friendly AOR side are songs such as Breathless and Jaded, the groove savvy I Wanna Be Your Drug, and Summertime Love with it's acoustic guitar under pinning. Meadows put some blues feel into the lively Home Wrecker, and Mogel sounds his soulful best. The atmospheric keys are a nice touch, too. A true rock ballad comes with Leaving Tonight, built upon Meadows acoustic lines, he trumps it with a soaring solo in the end. Then he gets to stretch his guitar muscles at the end with the instrumental title track and, yeah, we always new he was a terrific guitarist. All in all, Fallen Angel is a fine return to form, a solid effort, and an all around entertaining album of guitar-driven melodic hard rock. Recommended. 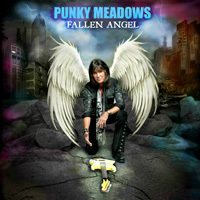 Punky Meadows' Fallen Angel is a fine return to form, a solid effort, and an all around entertaining album of guitar-driven melodic hard rock. Recommended.